This colorful fun CHARM IT! Congrats! Star Charm helps you celebrate victories and accomplishments (large and small) in a festive and fashionable way. Whether you're celebrating a team win, a first time soccer goal, a missing tooth, or an awesome test grade, this gold star of congratulations is a great reminder of a job well done. Featuring Congrats! 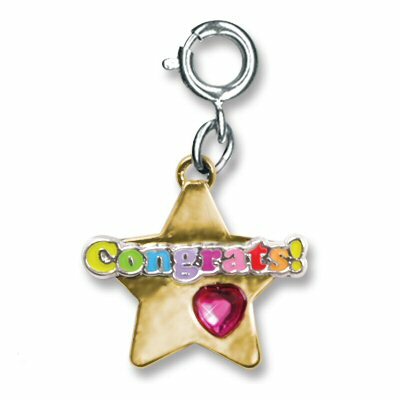 in a rainbow of colors perched atop a shiny gold star, this congratulatory charm also "shows the love" with a sparkly dark pink acrylic heart stone. Attach it quickly and easily to any charm bracelet with a simple snap of a clasp.